The Maid of the Mist sightseeing adventure that brings people to the bottom of Niagara Falls has been amazing passengers since 1846. 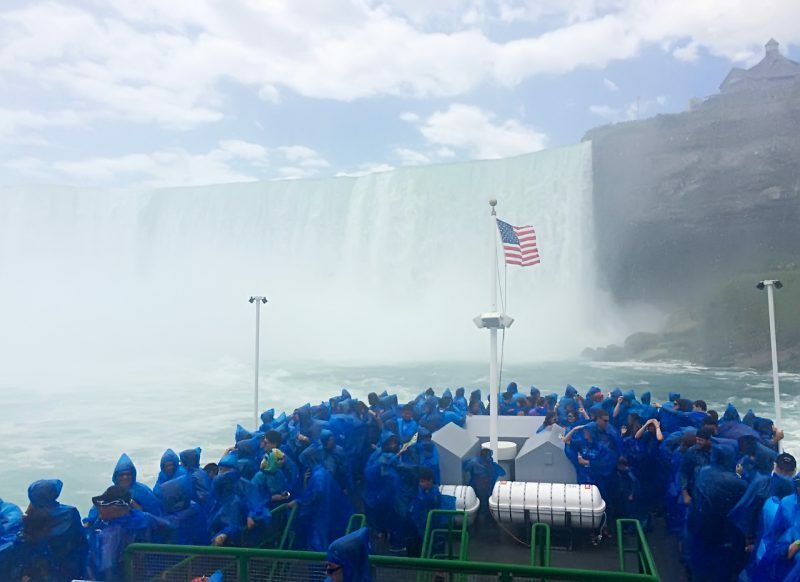 Recently One Systems Direct Weather loudspeakers were installed in both of the Maid of the Mist boats to ensure that passengers not only experience the seventh natural wonder of the world, but hear all about it as well. The two-deck Maid of the Mist boats are roughly 80 feet long by 30 feet wide with a capacity of 582 people. The new distributed sound systems consist of 46 106/HTH loudspeakers, 23 for each vessel. Andrew Messer, assistant manager marine, for the Maid of the Mist Corporation, played a role in the selection of the loudspeakers. The system was installed by the Tonawanda, New York offices of AV Solutions. "We are in the mist for approximately eight minutes per trip - five minutes of direct mist at the base of the Horseshoe Falls and the mist can be pretty heavy sometimes," Messer explains. "The previous systems had been on board for a number of years and it was time to replace them; the moisture just gets to them over time. We were looking for a state-of-the-art solution and One Systems had it." Twelve 106/HTH loudspeakers are mounted to the walls throughout the lower deck of each vessel. The upper deck is covered by 11 loudspeakers four are mounted on a mast near the stern, while 7 more are mounted under the eaves of the captain's bridge. In addition to exceptional clarity and sonic quality, the 106/HTH provides the direct weather durability the Maid of the Mist boats require. The enclosures use 316-grade stainless steel (marine-grade) for all structural and rigging points as well as rigging accessories. In addition, all metal components that are not structural are built with 304-grade stainless covered with a newly developed marine-capable polyester coating that provides the same durability as 316-grade stainless, making them ideal for applications like the Maid of the Mist ships. "The One Systems loudspeakers came highly recommended," adds Messer. "Most of the people we talked with were either familiar with them or had installed them in other outdoor venues so we were confident they would work for us." Each Maid of the Mist tour includes four pre-recorded audio segments that provide visitors with background about the area and falls during the tour. The audio system is also used for public address/safety announcements from the captain. The 106/HTH is a two-way design that features a wide coverage pattern of 100 x 70 degrees. The high frequency driver features low distortion and superior upper vocal range intelligibility. The 6.5-inch low frequency component features a large voice coil diameter that ensures high reliability and excellent linearity. The 106/HTH also features an installer configurable High Z or Lo Z mode. The High Z mode features a wide bandwidth 50 watt autoformer that presents input taps of 50 Watts, 25 Watts, and 12.5 Watts. The Lo Z mode is 8-ohms with 100-watt continuous power handling. "We are very pleased with the new sound system the clarity is exceptional," concludes Messer. "AV Solutions did a fantastic job with the installations and everyone, including our customers, couldn't be happier."